On Friday, January 12 at 10:30 a.m. Eastern, the Economic Policy Institute will host Susan Houseman of the Upjohn Institute as she presents findings from a new paper detailing the role of shifts in output, automation, and domestic outsourcing on the erosion of manufacturing employment in the United States. Houseman also highlights the disparate trends in computer and non-computer manufacturing. This paper challenges the claim that manufacturing job loss is primarily due to automation. 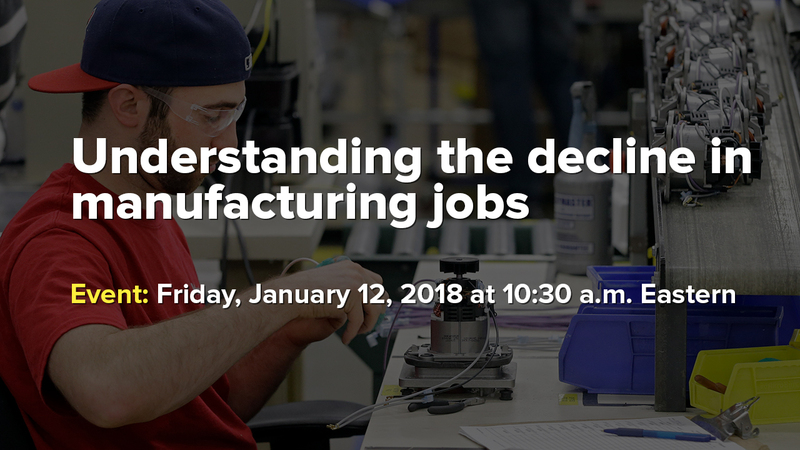 Joining Houseman in this discussion on job loss in manufacturing are Caroline Freund of the Peterson Institute for International Economics, Michael Hicks of Ball State University and Josh Bivens of the Economic Policy Institute. What: Discussion of a forthcoming paper by Susan Houseman on the causes of the erosion of manufacturing employment. Click here for paper.